This is a series of four e-learning courses on cardiology, diabetes and endocrinology, respiratory paediatrics and paediatric palliative care. They have been developed to help improve care and will be useful to all healthcare professionals who work with children and young adults. This includes paediatricians in all training and career grades, paediatric advanced nursing practitioners, GPs and GP trainees, ED staff and community healthcare workers. The sessions include self-assessment quizzes and a variety of interactive exercises. A certificate will be available after each course has been completed. However, this should not stop these courses being continuously used as and when applicable when dealing with a case in which they would be helpful. If you already have an account with e-LfH, then you can enrol on to the Paediatrics e-Learning Programme by logging in to the e-LfH Hub, selecting My Account > Enrolment and selecting the programme. You can then access the programme immediately in the My e-Learning section. 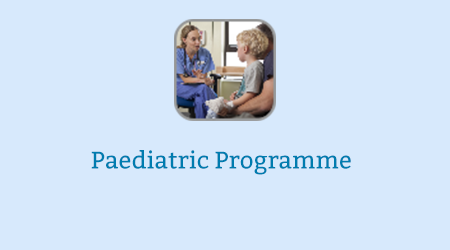 The Paediatrics e-Learning Programme is also available to NHS healthcare staff via the Electronic Staff Record (ESR). Accessing this e-learning via ESR means that your completions will transfer with you throughout your NHS career.